ViewRay uses a combination of individually established technologies (0.35 Tesla magnetic resonance imaging (MRI) and cobalt-60 (Co-60) radiotherapy) to achieve a difficult goal in radiotherapy: Meaningful imaging and adaptivity. These two components have been found to operate simultaneously. , The primary benefit of using the ViewRay system is the ability to image during treatment (as well as before for the purposes of planning). During treatment imaging, clinicians are shown magnetic resonance (MR) images at four frames per second while a target is auto-contoured at the same rate. This auto-contouring ability has enabled a gating approach based on high-contrast soft-tissue imaging. The beam will halt if the automatically generated contour strays beyond a prespecified range. Furthermore, the ability to adapt plans to the daily patient setup MR has the potential to improve dose accuracy. The plan can be reoptimized for the daily image or edited with the entire planning workflow with the patient on the [Table 1]. Cobalt source heads (three, 120° apart) are composed of lead and depleted uranium surrounded by stainless steel. A pneumatic system drives the sources in and out of the shielded "Beam OFF" position to "Beam ON" position. In all, 600 cGy/min is to be achieved at the 105 cm isocenter. The sources have a maximum activity of 15,000 Curies. In clinical mode, the heads can travel 120º to cover the full 360º. The gantry containing the sources is situated between two superconducting magnets with a bore of 70 cm in diameter. Imaging takes place in a 50-cm diameter spherical volume. During imaging, the spatial integrity is better than 2 mm in a 35-cm diameter sphere and better than 1 mm over a 20-cm sphere. [Figure 1] shows a schematic of the system. Given the potential for improved image-guided radiotherapy and adaptive radiotherapy, the treatment planning itself is not the highlight. Therefore, the aim in this study is to provide an early proof of concept that reasonable plans are possible on the ViewRay system, so that the more novel capabilities can be studied in this context. Dosimetrically, Co-60 exhibits an increased penumbra. , Also, the 60 multileaf collimators (two opposing banks of 30) used by ViewRay are 1.05-cm wide at isocenter (covering a square field of 27.3 × 27.3 cm). Furthermore, ViewRay provides its own novel optimization algorithm. Dose calculation takes advantage of a full Monte Carlo-based algorithm. The user can choose whether or not the calculation simulates the effect of the magnetic field. 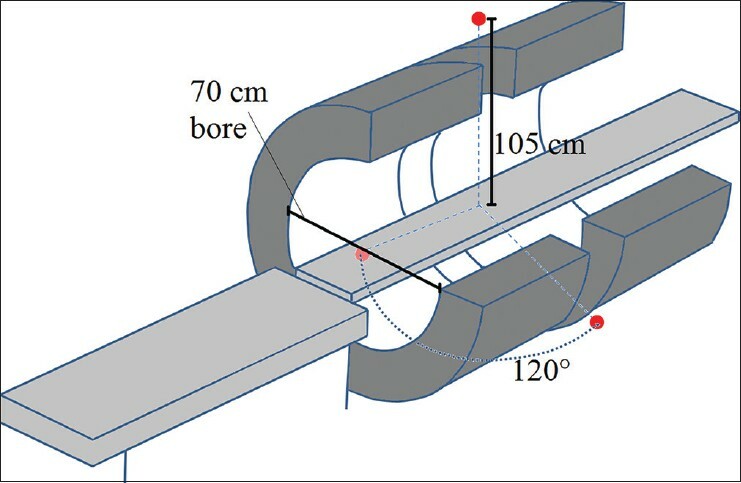 Previous studies in phantoms have shown that this dose calculation engine predicts negligible dose differences in a low field 0.3 T magnetic field in small air cavities. Photon interactions are modeled in the source itself and the multi-leaf collimators, gradient coils, and patient. Efficient variance reduction techniques are used to increase the speed. This study was conducted to understand the treatment planning capabilities of the ViewRay system, specifically comparing dosimetric indices such as conformity and homogeneity indices with conventional radiotherapy plans. 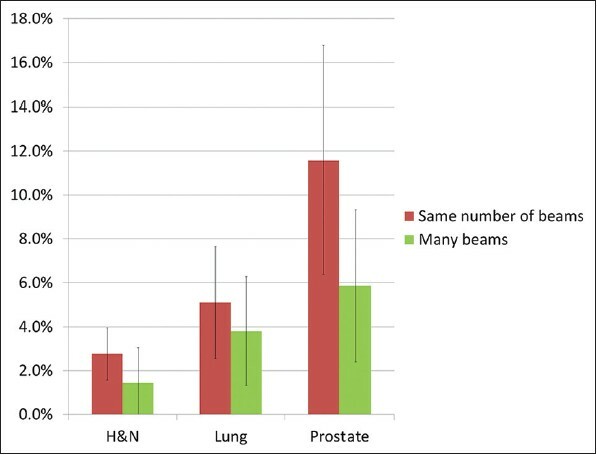 Fourteen anonymized patients receiving radiotherapy with a Varian Trilogy 2100EX or a Varian Clinac 600C (each with Millenium120 MLCs and unmatched beams) with 6 MV photons were identified with treatment sites of head and neck (six patients), lung (four patients), and prostate (four patients). Pinnacle (version 9.0) was used for treatment planning. In Pinnacle, a collapsed cone convolution superposition model is used. , In the IMRT optimization, fluence is optimized according to a quadratic objective function. The images, structure sets, and points of interest were exported and imported into ViewRay (version 3.4.0.2) for planning. The dose image from Pinnacle was also exported and used in a ViewRay plan for comparison. 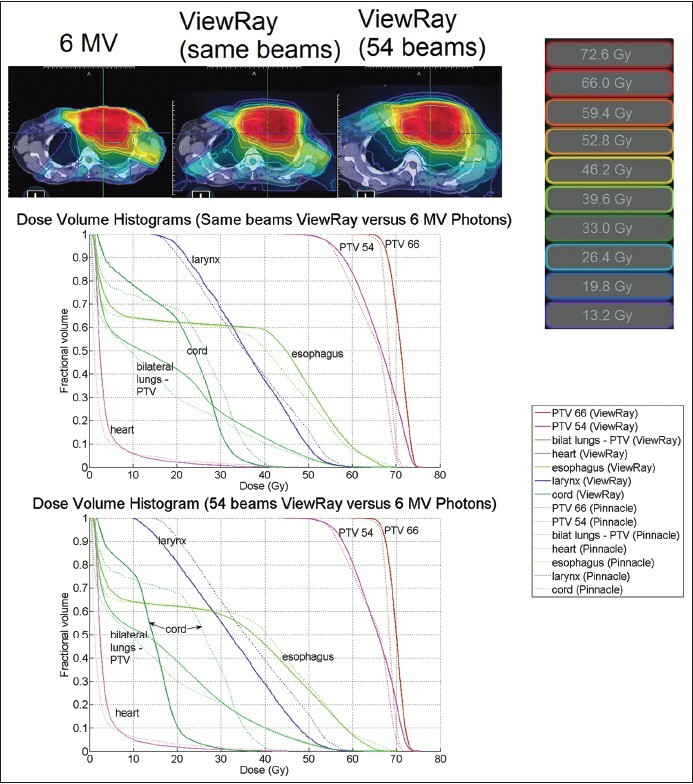 Intensity-modulated radiation therapy (IMRT) objectives used for inverse planning were also documented and entered into the ViewRay prescription so that ViewRay planning results can be quantitatively compared with Pinnacle. Each case was planned with two different beam configurations. First, a plan was created with the same number of beams (or within two) as in the Pinnacle plan. Minor adjustments to the beam angles were made when beams could be grouped together separated by 120˚. Second, a plan was created with 18 groups of three beams for a total of 54 beams to explore the upper limit of plan conformality without the influence of choice of beam angle. The workflow of IMRT operation was conducted as advised by ViewRay, namely, beginning with target coverage and moving on to critical structures. ViewRay optimization operates by assigning a penalty to every voxel defined by the importance and power described below to optimize the required fluence, which is discretized after optimization by a of a leaf-sequencing technique, which creates individual segments. Optimization is a convex nonlinear programming model that also considers any previously delivered dose. To begin with, "targets" and the "skin" contour were included alone in the optimization. A regular optimization power (penalty function exponential factor) and importance (linear penalty function scaling factor) protocol was followed. The importance is a scaling factor that can be used to set the relative priorities between structures. 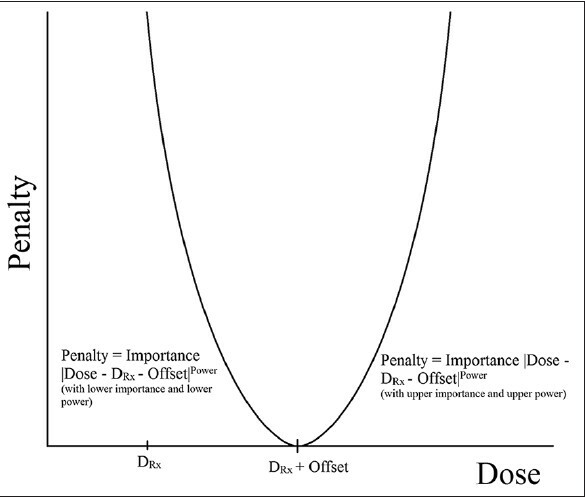 The power exponentially increases the penalty for a dose difference. An offset is also allowed for the target volumes [Figure 2], which shifts the penalty curve to the right, allowing for the specification of target coverage levels above 50%. 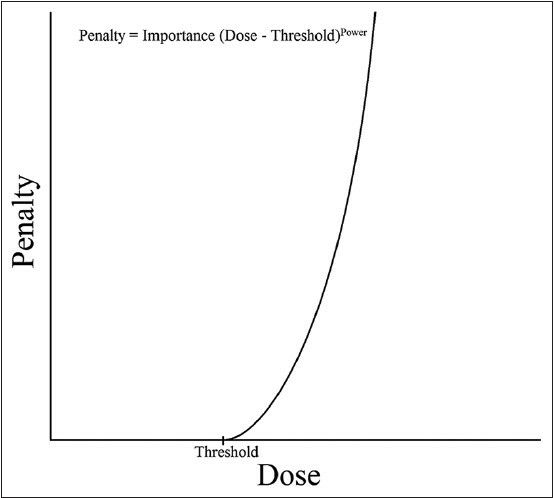 For critical structures, as shown in [Figure 3], the penalty function only applies to the right of the specified "threshold" dose, which is the dose above which penalization occurs. Planning target volumes (PTVs) received a power of four and importance of 10-25. Skin was assigned an upper power of two and importance of 50. The initial threshold for skin was about a third of the prescription dose. The IMRT efficiency, which optimizes a relatively smoother fluence map, was set at the default value of 0.5. Critical structures were later added to the optimization with upper power of two and importance below that of the targets. Thresholds started at the highest dose, still below the necessary level of dose sparing. The dose was normalized to give the same PTV coverage at the prescription dose between the ViewRay and Pinnacle plans. Further adjustments of optimization parameters were then followed to equate the normal structure doses as much as possible. Finally, the upper power for the PTV was increased incrementally to achieve a sharper dose-volume histogram (DVH) curve. Upper power increase was halted when the resulting dose spread began to compromise dose sparring of critical structures. In the final dose calculations, a dose grid of 3 mm was used. where,TV,TV DRX, and V DRX represent the treatment volume, the treatment volume receiving at least the prescription dose, and the total volume receiving the prescription dose, respectively. This index not only considers how well the target is covered (in the first ratio) but also assesses how close to the target the 100% isodose line lies (the second ratio). A value of one is perfect and anything below represents suboptimal conformality. Finally, the volume receiving 20% of the prescription dose (that lies within the body) was calculated for each case. This parameter demonstrates the degree to which the ViewRay plan was increasing the volume of the low-dose peripheral tissues. Furthermore, it quantifies the presumably increased volume receiving low dose in the 54 beam plans relative to the five to nine beams in the beam number matching plans. A homogeneity index increase relative to Pinnacle was consistently present in ViewRay plans compared with Pinnacle (in all but two 54 beam cases) as shown in [Figure 4]. But the change was relatively small in head and neck plans with the same number of beams. The homogeneity index increased both in lung and prostate plans. This represents an increased dose within the PTV, as the plan normalization kept the prescription dose coverage the same (87.6-99.9%). This effect was mitigated by allowing 54 beams. Increases in homogeneity index (increased inhomogeneity) were 1-4% for head and neck, 1-7% for lung, and 3-11% for prostate. In every case, there was a dose homogeneity improvement with 54 beams relative to the same number of beams plan. CI in ViewRay relative to Pinnacle [Figure 5] decreased in head and neck plans (with an average of 22% decrease in CI). This could be mitigated by increasing the number of beams to 54 (with only an 8% decrease in CI). In lung, however, a consistent improvement in conformity is achieved (with an average of 4% increase in CI, which rose to 22% with 54 beams). Prostate plans showed more mixed and inconclusive results with conformity; in one case, improvement relative to Pinnacle was observed. Furthermore, in two cases, there was a better conformity in the same number of beams plan than in the 54 beam plan. The volume receiving less than 20% of the prescription dose consistently increased in all but one of the ViewRay plans but was relatively small [Figure 6]. The average increase in volume relative to Pinnacle was 5% for head and neck and 2% for lung and prostate. 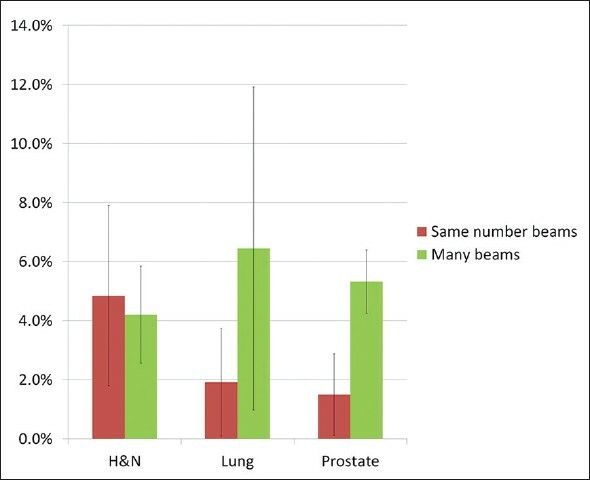 As expected, increasing to 54 beams resulted in a larger volume receiving <20% of D Rx for lung and prostate. For head and neck, the 54 beam plans generally did not change the volume getting <20% of D Rx . This observation is most likely due to limited surrounding tissue in head and neck. [Figure 7], [Figure 8], [Figure 9] display isodose lines at the three anatomical sites for sample plans. In the head and neck plan [Figure 7], ViewRay also achieved conformality for the two PTVs of two different dose levels. 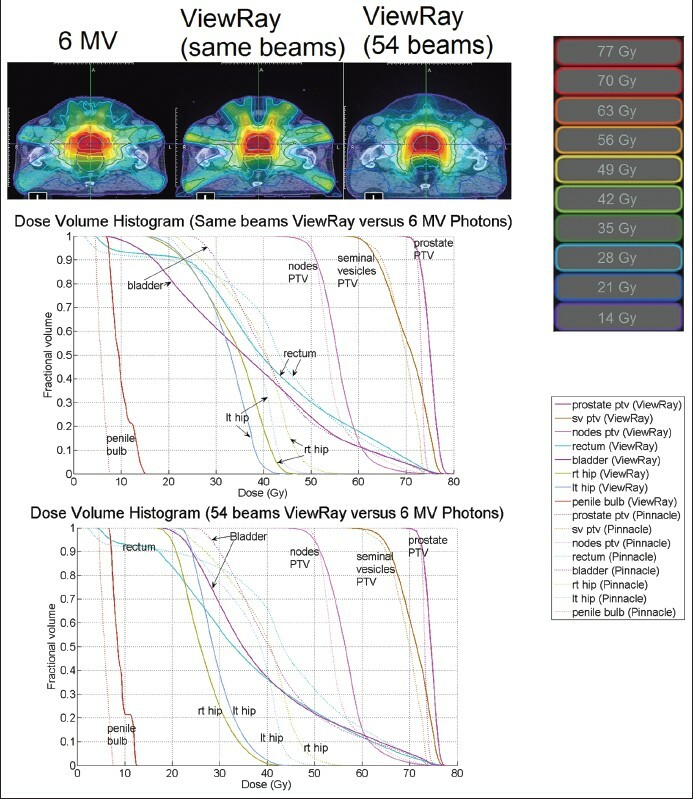 Isodose lines in ViewRay extend beyond the skin unlike in the 6 MV photon plan and do not reflect any meaningful dose differences. In the lung plan, good conformity is observed. 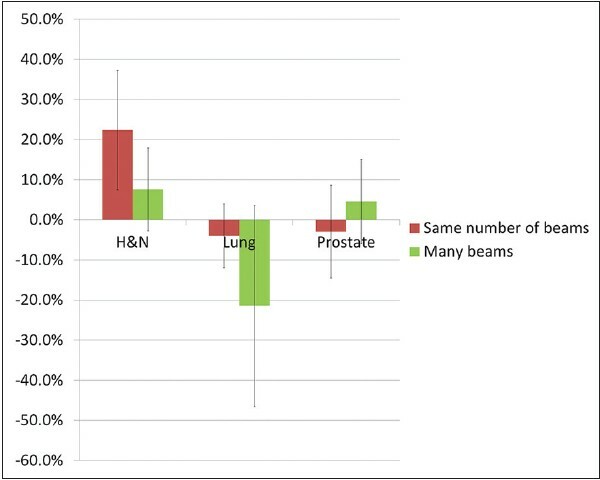 Hot spots were unavoidable for the same number of beam prostate plan but were eliminated by increasing the number of beams. All ViewRay treatment plans demonstrated good dosimetry especially for head and neck. The d max associated with Co-60 is uniquely suited for such a site with shallow targets. For targets reaching the skin, cobalt covers the PTV better due to its shallow d max . But for cases when the PTV does not extend out to the skin, ViewRay plans have less of a skin sparing effect, so the favorability of ViewRay depends on the application. Particularly, because head and neck is an anatomy that is prone to motion, therefore benefiting from the MR imaging as well, this anatomy is a logical and optimal site to treat with ViewRay. Hot spots required some management in ViewRay plans. For prostate especially, a dosimetrist will need to strike a careful balance between raising the skin contour's importance to minimize hot spots and ensuring a homogeneous PTV dose. For example, in case 11, the hot spot defined by the highest dose to a contiguous 2-cc region was 40.3 Gy in the 6 MV plan and 49.0 Gy in the ViewRay same number of beams plan (37.1 Gy in the 54 beam plan). ViewRay optimization tends to minimize the need for avoidance structures including rings, but adding avoidance structures to eliminate hot spots did prove to be an important way to spare shallow tissue. Adjusting the dose to critical structures is performed by altering the optimization parameters (importance, power, and threshold). This method works reasonably well for obtaining a suitable DVH. However, often it is the low-dose segment of the DVH curve that is most likely to cover too high a percent of the structure. To remedy this, a decrease in the threshold above which to penalize dose is necessary. The end result, though, is penalizing the higher dose parts of the structure even more, resulting in good high-dose sparing that can confound the sparing of other critical structures. Dose optimization and calculation time in ViewRay planning is done with full Monte Carlo and is one of the highlighted features of the system. As claimed by the manufacturer and verified here, the Monte Carlo calculation time was short, at about 1 min 42 s for a head and neck plan and at about 2 min 08 s for an abdomen plan. Each of these calculations was performed with the same number of beams as a clinical plan (eight to nine beams). A 54-beam plan on head and neck required 5 min 38 s of optimization and calculation time, but this represents a high upper limit. 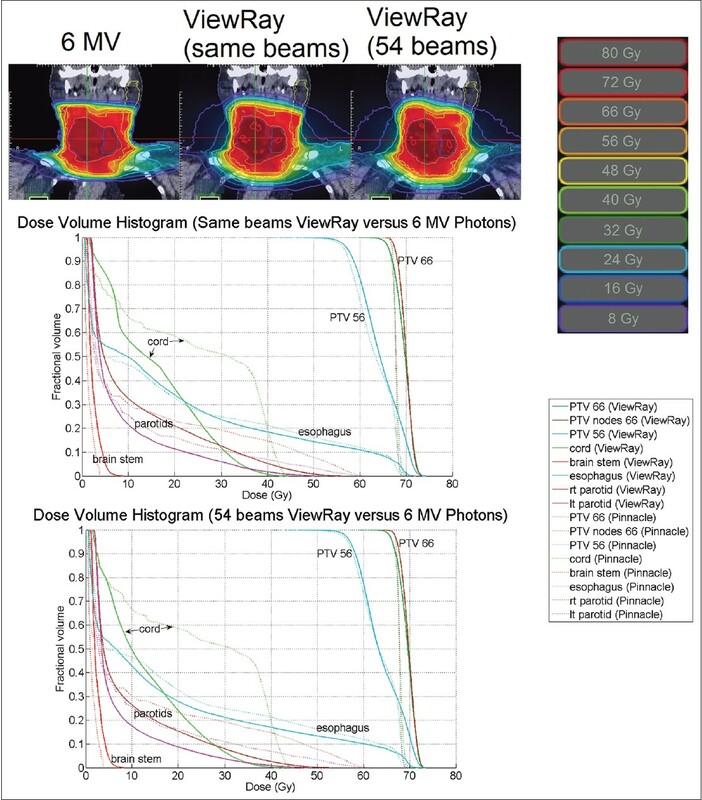 Overall, the ViewRay treatment planning and optimization generated comparable plans with varying degrees of dose homogeneity and conformity but generally consistent with the advantages and disadvantages of Co-60-based radiotherapy. In addition to source differences, the included MLC unit and specific machine dimensions determined the observed dosimetric characteristics. Head and neck plans showed the most similar homogeneous dose distributions, whereas lung plans demonstrated the most potential conformal dose distributions. It is anticipated that the greater benefit of ViewRay will come from its ability to image and plan in real time and thus a superior option to provide adaptive treatment delivery. 1. Dempsey J, Dionne B, Fitzsimmons J, Haghigat A, Li J, Low D, et al. A real-time MRI guided external beam radiotherapy delivery system. Med Phys 2006;33:2254. 2. Dempsey JF, Benoit D, Fitzsimmons JR, Haghighat A, Li JG, Low DA, et al. A device for realtime 3D image-guided IMRT. Int J Radiat Oncol Biol Phys 2005;63:S202. 3. Proimos BS. New accessories for precise teletherapy with Cobalt-60 units. Radiology 1963;81:307-16. 4. Sasane JB, Iyer PS. Relevance of radiation penumbra in high-energy photon beam therapy. Strahlentherapie 1981;157:658-61. 5. Yanez R, Dempsey JF. Monte Carlo simulations of air cavities in phantoms submerged in magnetic fields. Med Phys 2007;34:2590. 6. Mackie TR, Scrimger JW, Battista JJ. A convolution method of calculating dose for 15-MVxrays. Med Phys 1985;12:188-96. 7. Ahnesjo A. Collapsed cone convolution of radiant energy for photon dose calculation in heterogeneous media. Med Phys 1989;16:577-92. 8. Khan FM. The Physics of Radiation Therapy. Philadelphia: Lippincott Williams and Wilkins; 2003. 9. Wang XC, Zhang XD, Dong L, Liu H, Gillin M, Ahamad A, et al. Effectiveness of noncoplanar IMRT planning using a parallelized multiresolution beam angle optimization method for paranasal sinus carcinoma. Int J Radiat Oncol Biol Phys 2005;63:594-601. 10. Feuvret L, Noel G, Mazeron JJ, Bey P. Conformity index: A review. Int J Radiat Oncol Biol Phys 2006;64:333-42. 11. van't Riet A, Mak AC, Moerland MA, Elders LH, van der Zee W. A conformation number to quantify the degree of conformality in brachytherapy and external beam irradiation: Application to the prostate. Int J Radiat Oncol Biol Phys 1997;37:731-6.